I expect political hardball on any legislation as important as the health care bill. I just didn’t expect it from the United States Council of Catholic Bishops (USCCB). Who elected them to Congress? The role the bishops played in the pushing the Stupak amendment, which unfairly restricts access for low-income women to insurance coverage for abortions, was more than mere advocacy. They seemed to dictate the finer points of the amendment, and managed to bully members of Congress to vote for added restrictions on a perfectly legal surgical procedure. And this political effort was subsidized by taxpayers, since the Council enjoys tax-exempt status. When I visit churches in my district, we are very careful to keep everything “non-political” to protect their tax-exempt status. The IRS is less restrictive about church involvement in efforts to influence legislation than it is about involvement in campaigns and elections. Given the political behavior of USCCB in this case, maybe it shouldn’t be. Rep. Lynn Woolsey (D-Calif.) is co-chair of the Congressional Progressive Caucus. By the way, that’s “United States CONFERENCE of Catholic Bishops”. Not “Council”. You need to get your demagoguery straight, ma’am. Oh, and you may want to learn about something we call “paragraphs”. They are good things. First, what was the point of this amendment? It was to grease the wheels to passage of the House bill on Obamacare by restricting abortion funding. Otherwise, it very likely would not have passed. This was the bone to the blue dog Democrats (the difference between the two being whether the vote-buying occur to the left or right side) to goad a vote out of them for the overall bill. So, would she prefer to not have the bill pass at all? The woman is being foolish. So it seems to me that she’s simply angry at the role played by the USCCB in the pushing of this amendment. Granted, I’m no fan of any group who advocates the passage of such a bill (the amendment metaphorically only shined the massive stool sample that is the House Obamacare bill), which, I believe, will go on to be known as the single worst instance of congressional malpractice in American history. But that’s beside the point. The point is that a U.S. congressional representative wants religious organizations that participate in the legislative process to back off or face taxation. The point is that she wants to quash the freedom of speech of those whose long-held spiritual convictions are at odds with bureaucratic fiat by using the power of the IRS to tacitly approve those faith-based organizations which toe a line of her own drawing. The point is that she believes the prohibitions of the first amendment to the U.S. Constitution apparently do not apply to her. From what I can determine, the USCCB is not a political action committee, but a group of ranking Catholic clergy that represents said clergy. This means they can say what they want and lobby and participate in the government process as any citizen may. As I said, I’m no fan of a group advocating Obamacare in any capacity, but I’m also no fan of a group who went along with the priest pedophilia cover-ups and support illegal immigration and such. For the record, I’m not a fan of the Catholic church as a whole, but that’s tangential to this piece. But it is a tax-exempt organization because it is an entity that is not subject to undue federal interference by constitutional dictate, and its income has already been taxed and was given charitably to an organization that does not pay dividends from profit. Now, if that religious organization’s raison d’etre is to influence legislation, it is taxable since it’s essentially become a lobbying group or PAC. But that isn’t the case here. Another note of interest is the assertion this Woolsey makes is that the efforts of the USCCB are “subsidized by taxpayers, since the Council [sic] enjoys tax-exempt status.” No, it’s subsidized directly by tax-payers, since the Conference seems to be funded by tithes and offerings given to its parent organization, the Roman Catholic Church. Well, except for those monies given by illegals, but that’s another tangent that will also go unexplored at this time. But categorizing the activities of a tax-exempt organization as being subsidized by the government? What is she smoking? Oh, right, these progressive types believe that all wealth was taken illicitly from “the poor” and must be redistributed by themselves to make it right. If you disagree with the progressive, power-mongering Democrats in Washington, you are wrong. And, if you actively oppose their will, you are the enemy. This is an example of one of them venting her childish frustration for all to see. These people must not be left in power. 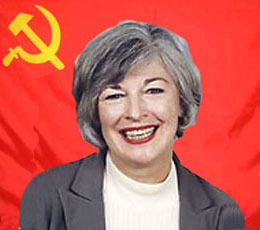 If you’re wondering where you may have heard of Rep. Woolsey before, she was the one responsible for Cindy Sheehan’s disruption of the 2006 State of the Union address. She had given her sole invitation to Sheehan, despite knowing she was a full-on loon.